In case you missed the stretch of tables with encouraging kids trying to convince you why their club was the very best during the third week of school, here is our overview so you don’t miss out on these amazing clubs! If you’re interested in crafting the exciting floats for our homecoming parade in October, join Float Building! Available for freshmen, sophomore, juniors and seniors, meet with your fellow classmates and enjoy taking part in this fun activity! Contact Ms. Babette Adkins for more information. Video Production Club focuses on making movies, playing with cameras and editing our very own school video announcements! If film-making is something you are interested in, contact Ms. Marna Bynum or attend one of their Thursday meetings after school in H-13. This is Reading Club’s first year, but they are ready to bring out the fun in reading! By setting goals and discussing their favorite books, members can look forward to interacting with other book-lovers in an interactive atmosphere. Contact Ms. Marna Bynum for more information or take part in Reading Club’s meetings, the second Tuesday of every month in H-12 after school. In BSU, you have the opportunity to learn about African culture, perform for rallies and enter a club that welcomes absolutely everyone. BSU club meets every Tuesday during lunch in IMC-1 starting August 28. Contact Mr. Jonathan Raman with any questions. Sing, dance and act along with Drama Club as they take a part in Homecoming activities and hang out with others who love theater. From bowling nights to sleepovers, Drama Club takes pride in their bonding outings. Meetings are held after school on Wednesdays in the theater. Contact Ms. Christine Welk with questions. Polynesian Club is a dance club that combines various Island dance styles, such as Tahitian and Samoan, to create captivating routines that are performed at rallies. Learn the culture, master the dance moves and contact Ms. Babette Adkins for more information. Math and Engineering club is for you if you love to combine math and science to create something with your hands. Design and build community projects with others who enjoy the same. Contact Ms. Lyudmyla Krasnova for more information. AVID Club helps organize fundraisers and blood drives for students and the school. Members find joy in helping the community as well as preparing for college through this club. Meetings are held every Wednesday after school in H-13. Contact Ms. Shauna Rodgers with questions. If you love dancing hip hop and learning about the Filipino culture, API is for you. Members learn dance routines—both modern and cultural—while also bonding in a welcoming atmosphere. Meetings are held once a month after school and during lunch. Any questions? Contact Ms. Susie Kim in G-12. Key Club is a volunteer outlet for students to get involved in community service activities with others. Joining this club looks great to colleges, surrounds you with other students who love helping their community and gives you a different perspective on selflessness. Meetings are held every week in H-16; contact Ms. Melinda Stewart with questions. Study hard and make new friends as West’s AcaDec team learns about the 60’s! With a new theme every year, this club allows students to show off their skills and knowledge in competitions while earning awards. Meetings are held every Monday after school in H-7. Contact Ms. Tida Khoun with questions. Pop and lock with one of our dance clubs: The Royal G’s. Learn how to dance hip hop while socializing and being inspired by other talented dancers at our school. 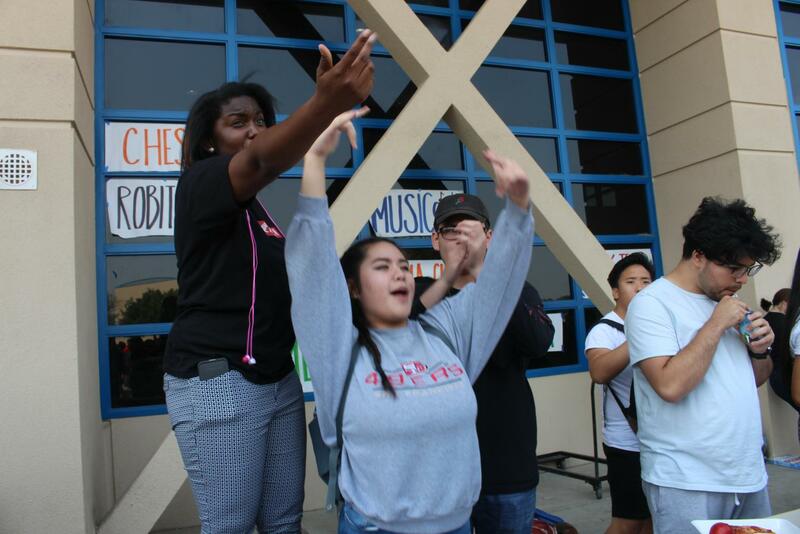 With 2-3 meetings per week, dancers come together after school outside the K building. Contact Mr. Jonathan Raman with questions. GSA Club specializes in spreading awareness for the LGBTQ community at our school and in our town. Through this club, you can become more informed, take part in GSA-led activities and help others with identity, sexuality and gender orientation. Meetings are held every Wednesday after school in P-10; contact Ms. Mayra Lopez with questions. MEChA embraces Chicanx heritage through dancing, fundraising and other community events. Their goal is to unite Chicanx children and youth in a safe environment while teaching about the culture. Meetings are held after school in P-6. Contact Mr. Bert Gomez with questions. ODAT is a youth empowerment club that addresses pressures students face today such as gang violence and drug abuse. By giving back to the community and taking part in various events including the Cesar Chavez March, this club gives students a chance to get on their feet and find a safe place. Meetings will start on October 15 and will be held in T-5. Contact Mr. Alex Campos with questions. If you enjoy community service, scholarship opportunities and wish to sit in the front during graduation, join CSF! In this club, you can surround yourself with other academically-driven individuals while also organizing Easter egg hunts, hygiene drives and more. Meetings are held once a month in MS-16, contact Mr. David Haut with questions. Cover the school in positive chalk messages, hang out with very happy people and spread kindness around West High with the members of Project Smile! The goal of the club is to bring more happiness to high school and promote kindness throughout the year. Meetings are held every Wednesday during lunch in IMC-1; contact Ms. Anne Duff for information. Study, practice and prepare for science competitions against other schools with Science Olympiad. Win awards and advance your knowledge on astronomy, towers, thermodynamics, ecology, human physiology and more! Meetings are held once every month in MS-23; contact Ms. Sol Ceja with other concerns. In this club, you will build robots and compete against other teams in competitions! Be a part of hosting your own tournament here at West High. Meetings are held Wednesdays and Fridays after school in H-6 or T-7; contact Mr. Randy Moehnke or Ms. Joyce Shade with questions. One of West High’s many dance clubs, Middle Eastern Club specializes in Middle Eastern culture and dance. Contact Mr. Scott Behnam with questions in K-1. Go to a real court house, defend a case or vote in a jury with Mock Trial! In this club, you can compete against other schools while also exploring law careers! Contact Ms. Shannon McMahon with questions in P-2. In Music Club, perform with some of West High’s finest musicians, playing renditions of classics and modern pop songs! Perform in the talent show, senior concert or at lunch with your own specialized instrument; all musicians with at least a year of experience are encouraged to join! Meetings are Fridays after school in K-2, contact Mr. Jonathan Raman with questions. Perfect your dance skills in the style of KPOP- a variety of different Korean dance styles! Perform at rallies and bond as a club together! Meetings are held in P-20; contact Ms. Linda Harding with any questions. In Spanish Club, bond with other Spanish-speakers and learners at movie nights, field trips and taqueria outings! Meetings are on Tuesdays at lunch in P-6. Contact Ms. Laura Henriquez with questions! Express your creativity through makeup and other cosmetology at Glam Club! Participate in giveaways, try new makeup and learn about different techniques! Contact Ms. Susie Kim for more information. If you are a lover of all things artistic, grab your supplies and get creating with Art Club! Help with murals, community events and fundraisers with Mr. Alex Nelson in G-1! Come together with your friends and church leaders for Christian Club. Discuss important high school issues from a new perspective and engage with a group of encouraging, loving leaders. Meetings are held Tuesdays during lunch in MS-21.